Two cannabis "gardeners" tending a £1m drugs factory were "expendable" links in a criminal network, a court heard. Albanian nationals Daniel Muhaj, 29, and Eglant Selenica, 35, were found living alongside the crop at an industrial estate in Redgrave, Suffolk. The pair, who are in the UK illegally, pleaded guilty to producing cannabis before magistrates in Ipswich and will be sentenced at the crown court. Their solicitor said the men had been victims "at the bottom of the chain". Jeremy Kendall, mitigating, said they had played "a lesser role", having been asked to tend the plants and avoid attention. They had each been in Suffolk for less than a month, he said. Selenica has a wife and eight-year-old son in Albania, and had travelled from Romania to the UK to find work on building sites before being offered £1,500 a month to guard the plants. Muhaj entered the UK in the back of a lorry from France, and felt he had no option but to take the job to pay off the £8,000 fee, said Mr Kendall. They were arrested on Monday, after police were alerted to a strong smell of cannabis by the unit owner and other nearby tenants. The premises were rented in November and the locks changed shortly afterwards, when the owner was told it was not secure enough, said prosecutor Lesla Small. 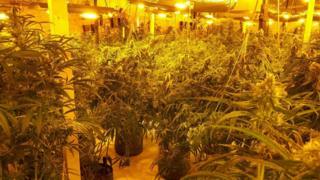 When police searched the unit they found "cannabis production on an industrial scale" with hundreds of mature plants, and sophisticated lighting and ventilation equipment. Muhaj and Selenica were remanded in custody and will be sentenced at Ipswich Crown Court at a date yet to be fixed. The court was told the sentencing guidelines start at three-and-a-half years in prison. The former vice-president declares his White House run with a rebuke of Trump over Charlottesville.